Up at 7 to set out at 8 for the walk to Culbone Church, the smallest parish church in England. A glorious morning, all blue and sunny. 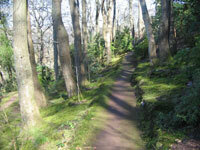 I set off down the track to Porlock Weir, breathing in the heady smells of wild garlic and squishing through the mud. I stopped for a breather at the Weir then set off up the hill for the long slog. The guy in the shop yesterday said it was either an hour and half or a mile and a half – reading the sign this morning, however, gave it away. Culbone church is two and a half miles away. Most of this is uphill. The nicest thing is most of the way back is downhill. I set off along the small coast track. Stopped at the Worthy Toll gate for a few photos. I particularly like the sign that says “In the absence of the Toll Keeper please put £1 in the slot in Lodge door & close the gate – Thank You”. The honesty policy is alive and well in down town Worthy! Being on foot precluded me from forking over £1 so I strode on through the arch of the toll gate and on up the hill. I very quickly came across a big Victorian arch, which looked like a railway tunnel (apart from the fact that if a train had gone over the top it would’ve then gone crashing into the sea on the other side). Once through and further round, I walked through another but this one appeared to have battlements and arrow slits. Maybe the whole thing is a folly built by a castle-mad train spotter. My Ordnance Survey map marks them as simply ‘tunnels’. From here on in the trail kept going up and getting steeper. At one point little signs declare that there has been a landslide so the path is closed. This would have been very annoying (memories of trying to walk from Hastings to Pett Level spring to mind) except that the kindly landowner has allowed people to walk along a track that goes through his property and runs alongside the ruined one. This is very handy as the original path is the coastal path that follows the entire coastline of the UK (omitting Northern Ireland) and can you imagine how you’d feel if you’d walked all the way from, say, Whitby and suddenly had to turn back because of a silly landslide! What it did mean was more going up rather than straight across. So I continued climbing. Fortunately the track levelled off before the nose bleeds started and I had my first sight of the tiny Church of St Beuno. It nestles in a valley, with a stream running down from the hill behind it, and in the company of two houses. That’s Culbone – two houses. The sign as you walk across the little stone bridge declares that Culbone is a settlement. I’ll vouch for that. I was hoping for a Starbucks or at the very least a Tesco but no, just trees, stream and the smallest parish church in England. St Beuno (who wasn’t Italian) was Welsh and born in the 6th century. Apparently he rescued St Winifred from King Caradog. He is regarded as the most important Welsh saint after St David. His name is pronounced ‘Bayno’. He has two feast days (21 April and 14 January) for some reason and in art is represented restoring his niece’s head! 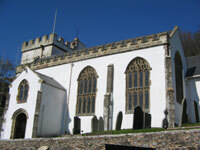 The church itself has the honour of appearing not just in the Domesday Book but also in the Guinness Book of Records! Its total length is only 35 feet and the pews will hold 33 people if they all squish up. After Sunday lunch, you can only fit about 12 in. Although it’s in a small valley it still sits 400 feet above the sea – not that you can actually see the sea from the church – too many trees for that. Inside is a lovely 14th century screen and the small pews are amazing. Behind the door is what is believed to be a Norman font. You can almost touch the walls on either side with your arms outstretched! A box pew by the screen was put there for the Lovelace family of Ashley Combe House (that’s Ada and her family). It’s all very neat and compact with nothing really fancy. The whole place is very, very peaceful. It even has bells though they are also very small but I didn’t get to hear them. Or maybe I did but they’re so small they make a very little sound. It was 10 when I finally started the trek back. On the way to Culbone I didn’t see a single person but coming back I passed heaps heading down. One girl in particular with a collie and 56 tons of equipment on her back and a very odd chap in normal shoes, polyester trousers, nylon jacket and shirt. Not that there’s anything particularly odd about that per se except that he’d walked two and a half miles like that along sometimes muddy, always rocky tracks. Unless, of course, he actually lived in the woods up a tree and had come down for a forage. On the way back I noticed a field where someone had planted a spiral of daffodils, ending in some sort of stone block. It looked great but will be much better when the daffs all bloom. Lovely idea…a pity our back garden isn’t quite so big! I arrived back in Porlock Weir in time for a beer at the Ship Inn. I thought I was going to have to ask for a half pint as all I had in cash was £2 but, the angel of proper purchasing was obviously on my side. Behind the man behind the bar was the price list – Exmoor Brewery Ale only £2 a pint! Phew. I sat outside in the chill sunlight and enjoyed every single drop. Walked back to the house to find Mirinda lying on the lounge reading. She’d spent a lovely morning doing what she loves – writing, reading and lying down. I had a much needed shower and we planned the afternoon. 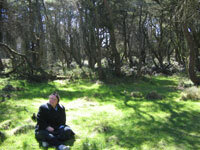 First we drove up the horrifying Porlock Hill to the heathland of Exmoor. This hill is so devastatingly evil that it is world renowned. In the West Country whenever anyone says something is steep, the rejoiner is “but is it as steep as Porlock Hill?” Before the arrival of the car, no carriages of any kind could be taken up or down it. Everything that had to be transported into Porlock had to be placed in bags and lashed across horses. The hairiest bends have signs warning pedestrians not to stop there as it’s very, very dangerous! The top section, when it was tarred, had to be rolled by hand because the steam roller wasn’t able to do it. This is one BAD bit of road. There are many horror stories of lunatics having picnics in the escape roads on the sand that is supposed to stop an out of control car and of brakes burning out and cars simply speeding through Porlock and ending up buried in a shop window. We didn’t have any problem but did figure that Neville would NEVER have made it. Sidney made short work of it. We pulled off the road into a carpark which has to have one of the all time best views for an ice cream van, and went off in search of the Whit Stones. I eventually found them in the middle of the copious heather. They were leaning over rather than the usual standing – this explains why they were hard to find. I posed on one and Mirinda took my photo. We then strolled back to the car, stopping off in another carpark for a bit so Mirinda could sit and stare at a bird she didn’t know. Back at the car we had a yummo ice cream each – Mirinda’s was made with sheep’s milk – then continued on to the legendary Culbone Stone. 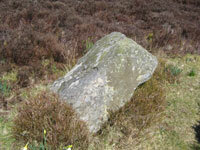 This small standing stone was discovered in 1940 and is believed to have been carved in the 7th century. How anyone found it is beyond me! It’s hidden away inside an odd wood of creepy trees and, at just under a metre, could be very easily missed. The signs help but I have to assume they weren’t there in 1940. Mirinda sat by the Culbone stone and listened. She told me to be very, very quiet and listen as well. There was nothing to hear but for the faint trilling of birds and the noise our blood makes as it gurgles round our bodies. It was freakily silent. There’s also supposed to be a line of standing stones just down the road but I think they’ve been moved as we could only see one quite a distance from the road – it’s all private property and behind big wire fences so we couldn’t actually approach it. 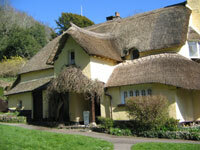 Back in the car we headed for Selworthy, a National Trust village and thought to be one of the prettiest in England. At the top of the steep hill (but not as steep as Porlock Hill!) a truck was parked outside the church taking up three quarters of the road so everyone had to breath in so their cars would fit through. The truck was there because the church is undergoing renovations but it could have been parked a little bit more conveniently. Still, Sidney is such a slight, slip of a girl, that we slid by and parked. All Saints Church, Selworthy has a fantastic view. I could think of gloomier places to spend eternity. After the Lilliputian church of this morning, this one was like a cathedral. Big and blocky, imposing itself on the landscape. It is one of the rare churches to still be coated with a mixture of lime and tallow which protects the local stone from severe weathering. As you walk into the church the first thing that surprises is the balcony above the door. 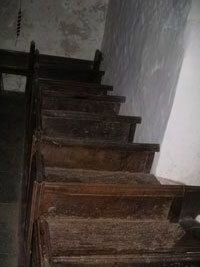 This was once the pew of the Acland family who ran things once – it was the Acland’s who gave the village (and most of their estates) to the National Trust. Can you imagine owning a village? A rather odd woman poked her head into the church then disappeared again, never to return as if the contents surprised her. What did she expect to find behind a church door? A supermarket? Actually, to be fair, there is an old chapel in Innsbruck that’s actually a McDonalds. We had a brief wander round the churchyard then down into the village proper. The National Trust has an information centre and a shop in one of the perfect houses in the village…which was shut. So we didn’t find out much more than what the church brochure tells us. Unfortunately it was not very forthcoming about the tea shop. A perfect little tea shop, in a perfect little village. Ah, not quite. Jack would love this one. The menu lists all manner of food stuffs, including five different types of ploughman’s lunch. After yesterdays sweet-mania at the Whortleberry, we decided savoury was the go and having determined that Mirinda had a hidden £20 note, we decided to order the biggest ploughman’s with farmhouse ham. Eventually the guy came to take our order – Mirinda was wondering when we should give up waiting just before he came over – and the moment Mirinda asked for a ploughman’s, he blandly said “There’s none today, just cakes.” No other explanation. We were devastated. Mirinda had a piece of shortbread for some reason unknown to either of us while I just had a coffee. We left as quickly as we could ingest. Traveller be warned! Take your own food and drink when visiting Selworthy. We returned to the car via the tithe barn. This is quite magnificent. 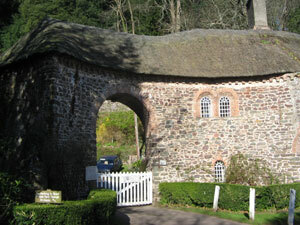 It was built in the 14th century and is in the grounds of the former rectory. In the end is a rather odd window which would look far more at home in a church. And it does. It was taken from the church in 1826 and put in the barn. Around the side there is another little creation which seems to belong in a church. This time, however, it would have been original. 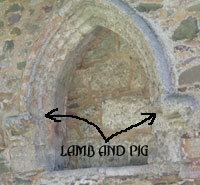 The almost obliterated figures beneath the arch are thought to be lambs and pigs. This sort of thing they did for good luck. Back in the car we set off once more back to Porlock because it was finally time to visit Greencombe, a garden not far from where we’re staying. This garden has been around for fifty years, begun in 1946 by Horace Stroud who had always wanted to run a garden. Oddly he was a county councillor who was also a window dresser. He thought this gave him some insight into gardening. I have to say it’s a very impressive garden, although Mirinda was somewhat less impressed by the woman who sold us the very expensive tickets to go in. I’m not sure what the woman did but, believe me, given Mirinda’s reaction it was pretty much the worst thing anyone could do. So, to retaliate, Mirinda decided we’d go around the garden in the reverse order she had suggested. It was a lovely garden but the highlight for me was the little chapel. It is called the Chapel of our Lady of the Secret and features a lovely statue of a mother and child all carved from a single, solid piece of chestnut. It stands on a large piece of oak. Outside, running down the steps is a banister made from a continuous length of chestnut 17 feet long! It is all very lovely and was started in 2000 and completed and blessed in 2001. Everything apart from the roof tiles was grown in the garden. It looks out over the marsh and into the bay. A lovely spot. Finally it was time to leave and, after Mirinda had an odd chat with a very old deaf woman who had been left with the car because she couldn’t walk up the drive, we set off back up the road to Porlock. I was dispatched for supplies (beer and toilet rolls) while Mirinda went back to the house to start our roast lamb. Dinner was divine. We ate, watched TV and crashed.